On Aug. 8, 1956, at the suggestion of Mrs. Mary Land Dillon, well-known civic and cultural leader, a group of 13 Junior League members representing the Association of Junior Leagues of America (AJLA) from Massachusetts to Mexico met to discuss starting a service group in Pensacola which they hoped would in some years become affiliated with that Association. On Aug. 13, this original group of 13 met with other Pensacolians to become the 37 founders of the Junior Service League in Pensacola. On Aug. 29, the Junior Service League was chartered by the State of Florida and standing committees were functioning under bylaws. In October of 1956, members took their first required provisional course and opened the Thrift Shop where used clothing was donated and sold by members. In November, the official newssheet was started as a mimeographed leaflet. The first professionally printed edition was issued in 1958. In 1957, Junior Service League members assisted in establishing the Escambia County Legal Aid Society by furnishing volunteers and financial assistance until 1958, when the financial obligations were assumed by the United Fund. That same year, Picture-of-the Week was started in cooperation with the Pensacola Art Center, later to expand to include a brochure and a slide library to be made available for schools and community groups. In 1958, members focused on a project to provide TB X-Ray units to the community. The units were staffed by Junior Service League members. In 1959, members furnished the Commandant’s Quarters in the restored Spanish Village for the City of Pensacola’s Quadricentennial. In 1960, Junior Service League members established the Pensacola Junior Service League Speech Program. In 1961, the State of Florida granted a charter to the Pensacola Junior Service League Speech Program, Inc., and the Speech Clinic was housed and furnished at 1109 West Avery Street. In 1962, a full-time senior therapist was hired for the Speech Program to provide regular classes for speech therapy. Volunteer workers began work as teacher’s aides and clerical assistants. In 1963, the Speech and Hearing Clinic moved into larger quarters and became accredited to train interns. 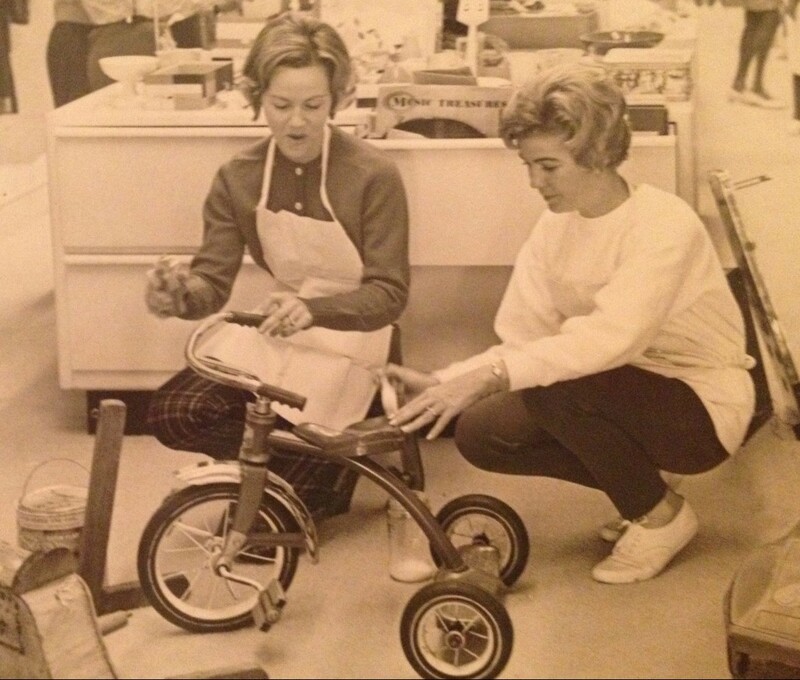 In 1967, the Speech and Hearing Center became part of the Rehabilitation Center of Baptist Hospital. From 1964-67, representatives of AJLA made inspection visits to Pensacola. The orientation into the Association was initiated in 1967. The Junior Service League was formally accepted to AJLA on February 8, 1968. During the 1968-69 League year, Pensacola delegates attended the AJLA annual conference and regional meetings. In 1966, Junior Service League members initiated a Family Art Gallery in cooperation with the Pensacola Art Center. That year League members also teamed up with the Pensacola Heritage Foundation to produce the first “Evening in Olde Seville Square,” which then continued for many years. The Junior Service League Thrift Shop continued to succeed and was moved to a new and larger location. In 1968 the League hired a Sales Manager for the shop. Guide Book for Historical Museum edited. Suitcases Around the World program launched. Staffed Junior League Day at Children’s Hospital. Learning Disabilities Center approved for new project. Large Auction approved for upcoming fundraising initiative. The Learning Disabilities Center opened. The League’s “Drugs Are Like That” film was produced. The Speech and Hearing Center became Baptist Hospital Speech and Hearing Center. Mrs. Walter Swayze, AJLA financial consultant, visited the Pensacola League. A Headquarters Finding Committee was formed to search for a location to house the growing organization. The First Junior League Bargain Sale held in 1971. Bargain Sale was held every other year throughout the 70s, raising $12,000 in 1973; $16,434 in 1975; $24,101 in 1977; $27,000 in 1979. League members adopted the Association Management Process. Two major community projects were adopted – the Rehabilitation Institute of West Florida, Inc., with $5,000 seed money, and Volunteer Pensacola, with $19,500 provided over a three-year period. Volunteer Pensacola opened its doors Oct. 29, 1975. A slide presentation was prepared on the Rehabilitation Institute and League members were trained to present it in the community. A Bicentennial Party was held at the old L&N train station, raising nearly $7,300 for the Community Trust Fund. Mrs. Douglas Howie (Frazier) hosted a celebration of JLP’s 20th anniversary. The film “Drugs Are Like That” was placed in West Florida Regional Library Collection for public accessibility. A new project was adopted – Family Life Workshops. The project began in 1977 with $4,000 designated over a 3-year period. League members voted to continue to support Volunteer Pensacola, earmarking an additional $9,500. The first Family Life Workshop with Children and Youth Services was begun. A new project, Arts Etc., was adopted with budget of $4,500 for first year. Members of the Provisional class co-produced a television series on Community Issues. Arts Etc. completed its first year at Brownsville Middle School and League membership voted to include Ferry Pass Middle School in second year. League members voted to hold a Leadership Seminar in 1980 to prepare members to teach management. Arts Etc. was conducted in two county middle schools with expansion to third middle school planned for the following year. Ren Fortier (Teren Company) trained 35 League members in management/leadership techniques. Fortier and League trainers conducted a community seminar attended by 170 individuals representing 77 community agencies. Ninety-four League members and 17 non-League members took the Volunteer Career Development course. In 1971, the League rented office space at Hotel San Carlos. The League moved out of San Carlos in 1974. A new Headquarters was opened at the Tourist Information Center during the 1977-78 League year and a part-time secretary was hired. During the Association annual conference of 1972, the delegate body voted to restructure the Association of Junior Leagues. Junior League of Pensacola and other Leagues in Region V joined Tennessee, North Carolina and South Carolina to form Area III, with Area Headquarters in Atlanta. An Environmental Water Workshop was held in 1971. $500 given to support the Action ’76 project, a “mini park” project at Aragon Court. $300 given to Fiesta of Five Flags for a Spanish Education Kit. $1,003 given to fund the Florida Center for Children and Youth. “Fifties Party” held to raise money for new Headquarters. Co-sponsored the Asolo Children’s Theatre for grades K-3. Participated in Pensacola New Journal Charity Bazaar with Cookbook Booth. The Thrift Shop was redecorated and renamed the “Junior League Shop” early in the decade. The shop was closed on May 31, 1974. Participated in Impact Survey on Criminal Justice and sent delegates to seminar in Houston. Sponsored the 1975 Festival Discovery Tent. Charity Benefit held on Aug. 24, 1974, raised $6,681.44. The League sponsored the Volunteer of the Year Awards Luncheon in April 1975. Sustainers sponsored the luncheon the following year. A Career Development Seminar was offered to League members. Support approved for “Five Sense Store,” a traveling exhibit of the Smithsonian Institution, in November and December, 1977 ($4,500). In 1966 and 1967 the League provided Christmas gifts to more than 60 children in the custody of the Division of Youth Services. The membership sponsored the Pensacola Horse Show during the 1977-78 and 1978-79 League years, raising $5,500 the first year and $7,800 the second year. During the 1980s, the Junior League of Pensacola continued and initiated numerous community projects. By the end of the decade, the League had found its new permanent headquarters building, setting the foundation for even more future growth. A groundbreaking for JULEP headquarters at Jefferson Park, 3298 Summit Boulevard, Suite 44, was held May 31, 1989 and the League moved into the new building in October of that year. Prior to the opening of the new headquarters building, the League was housed in the Brent Building (1980-81 to 1984-85) and 909 E. Cervantes Street, Suite D.
The CHEC project proposal was adopted and $1,700 was allocated to sponsor a Cultural Roundtable and to print the Children’s Cultural Services Brochure. Allocated $22,500 for an Information & Referral Service jointly funded by Community Schools, County Social Services, HRS and the United Way. Allocated $22,100 for the Child Abuse Prevention Services in cooperation with Favor House. Arts Etc. was presented to more than 1,200 7th grade students in three middle schools. Presented Community Board Training to 12 community boards. Presented a Public Relations Seminar attended by 105 agencies. Arts Etc. was presented to more than 1,900 7th grade students in five middle schools. Presented a community seminar on stress conducted by Layne Longfellow Ph.D., a behavioral psychologist from Arizona — our 25th anniversary present to the community. Voted to publish a cookbook and to sell gift wrap as new fundraising projects. Arts Etc. was presented to 1,900 7th grade students in five middle schools. Allocated $2,000 for the first year of Leadership Pensacola. Established the J. Earle Bowden Young Historian Award to be presented annually to the grand winner of the Escambia County History Fair. The League was selected as the adult group winner of the Volunteer of the Year Award by Volunteer Pensacola. Arts Etc. was presented to more than 2,600 7th graders in six middle schools. Implemented full placement in either a community or in-league placement. JULEP President Marcia Lindstrom attended a White House Briefing on foreign policy, the federal budget, substance abuse, refugees and victims of crime. Implemented four new community projects: Mini-Grants, Speak Up and Say No, Tots ’n Teens, and Substance Abuse Roundtable. Arts Etc. was presented to more than 2,900 students in seven middle schools. Provided $3,000 in matching funds for a National Endowment for the Arts grant that provided an ‘Artists in the Schools’ program, in cooperation with the Northwest Florida Arts Council. Some Like It South! was published in August and introduced to the community at a party attended by more than 1,500 people. More than 11,400 copies were sold and a second printing of 15,000 copies was ordered in December. The cover received Addy Awards in both local and statewide competition for excellence in advertising achievement. Continued five projects: Arts Etc., Mini-Grants, Speak Up and Say No, Substance Abuse Roundtable and Tots ’n Teens. Completed phase one of Adolescent Pregnancy/Child Watch. Continued four projects: Arts Etc., Mini-Grants, Speak Up and Say No, Adolescent Pregnancy. Expanded Substance Abuse project to initiate new project, Woman to Woman. Established our first Community Advisory Board. Initiated a new fundraiser, Marketbasket, which raised more than $41,000 its first year and was voted for continuation. Presented Kaleidoscope, in conjunction with Hallmark Cards, to over 3,100 children plus hundreds of teachers, parents and volunteers. Established a new project, The Junior League Awareness Team, with partial funding from the Escambia County School System, the Santa Rosa County School System, and the Gannett Foundation. Continued three projects: Arts Etc., Mini-Grants and Speak Up and Say No. A part-time office manager was hired. Opened doors to Discovery, a hands-on museum project on third floor of T. T. Wentworth, Jr. Florida State Museum, with “Treasure, People, Ships and Dreams” exhibits in December 1988; April 1989 changed exhibits to “Anything Goes.” Provisional class developed Discovery Activity Book. Discovery logo received local and state Addy Awards. Continued three projects: Arts Etc., Speak Up and Say No, and Mini-Grants. “Discover the Junior League,” a 30-minute BLAB TV show, premiered January 1989. Awareness Team Committee won Volunteer of the Year-Adult Group Category. Create-A-Book began its first year. Moved into current location at Jefferson Park on Summit Blvd. in October 1989. Arts Etc. reached 4,500 students in 15 middle schools. Speak Up and Say No reached 6,275 students in 28 schools. The Junior League Awareness Team was introduced in January 1989 and reached more than 4,000. Discovery, in its first full year of operation, received more than 44,000 visitors. Junior League Grants for Excellence (formerly Mini-Grants) collaborated with both the Foundation for Excellence in Escambia County and the Santa Rosa Educational Foundation. JULEPs signature fundraiser, Bargain Sale, successfully continued each year. Some Like it South maintained high sales each year resulting in a third printing in 1988 and a fourth printing in 1990. The League established the Training Committee and combined the Nominating and Placement Committees into the Personnel Committee. Continued BLAB-TV show, “Discover the Junior League,” with Paula Jones as host. Received overwhelming community-wide support for an Information & Referral Service at a seminar attended by 220 people from 66 agencies in 1980-81. The League completed a second year of providing money and manpower to Information and Referral Services of Escambia County. This was then incorporated as a program of Volunteer Pensacola in 1983-84. Several in-league workshops were offered including: “Issues Selection”, “Coalition Building”, “Stress with Success” “Creative Life Planning”, “Skills for Success”; a 36 hour course in management and leadership from Junior League of Boston. A variety of workshops on education, leadership, motivation, public speaking, grant writing, parliamentary procedure, and career enhancement were also offered. In 1985-86 alone, 21 separate training sessions were held. The League sponsored or co-sponsored several community seminars including: “Success with the Press,” “The Marketing Game,” Senior Citizen’s Drug Education Day, David Elkind seminars, and seminars on child advocacy, leadership and time management. The League brought the Crittenton Awareness Team of Nashville to Pensacola; and organized their appearances for the League, community and media. An in-League support group was formed by the Woman to Woman committee for those who have drug/alcohol related problems within their families. AJLI leadership and speakers, including 1984-85 AJL president Carole Hart, visited and spoke to members. Sponsored the first day trip for members to the State Legislature. Organized and implemented publicity for The Chemical People. Provided $3,000 grants to Leadership Pensacola each year from 1983-1987. The Junior League Harbinger received a Pensacola Press Club Award for Special Achievement. JULEP received an Award of Appreciation from the Historic Pensacola Preservation Board for the Discovery project and support of the Pensacola Historic Village. The League was a recipient of the statewide Outstanding Support for Community Education by an Agency or Organization Award presented by the Florida Association for Community Education. The Enabling Fund, in its first year, granted $1,000 to other non-profits in need. Consolidated grants with Acquisition Team to form Community Support Committee. Established new Fund Development Committee and provided two days of intense training by Jane Dunne, Sustainer from Dallas. Adopted two new projects: Habitat for Humanity and Bucklebear. First “Breakfast With Your Boss” was held. Presented the first “Family Expo” in collaboration with Lakeview Center, WEARTV Channel 3 and Sacred Heart Hospital. Parenting tips developed by JULEP and presented on Channel 3 TV to promote the one-day event won the Social Service Impact Award from the Florida Public Relations Association and the AJLI Communications Award for PSAs, and the committee was a finalist for Volunteer Pensacola’s Golden Rule Award in Education in the Adult Group Category. Produced Awareness Team video which premiered at “Breakfast with Your Boss” and won Addy Silver Angel Award from the Northwest Florida Advertising Council. The first Junior League Community Paper was distributed at Bargain Sale. Held first “Women in Leadership” luncheon with Lois Benson, Sue Straughn and Jean Norman as speakers. Held 40th Anniversary Celebration in April. Four new projects were initiated: Done in a Day, Family Visitation Center, Juvenile Justice Teen Court and Success by 6. The first American Girl event, Samantha’s Ice Cream Social, generated $5,700. Three new projects were initiated: Civil Citation Program for Juveniles, The Kids on the Block and Escambia Healthy Kids. Initiated a new project: Women Helping Women. Took a public stand favoring fluoridation of the water and worked to effect passage in our community. Created and developed a professional brochure promoting JULEP and defining the League’s purpose and community projects. Installed new computer system and established JULEP website. Marketbasket netted a record $92,000 and was attended by 6,934 people. A new special event, a car raffle, accounted for $12,000 of the profit. Major sponsors were Sandy Sansing BMW and NationsBank. Established an endowment at Pensacola Junior College for Women in Transition. Adopted Women in Transition as our focus area for the next four years and established a Women’s Resource Center task force. The following projects were initiated and/or continued: Arts Etc., Speak Up and Say No (turned over to the Escambia County School District in 1991-92), Discovery (membership voted to gift to the Historic Pensacola Preservation Board in 1990-91), Create-A-Book (sold in 1991-92), Junior League Awareness Team, Junior League Grants for Excellence, Enabling Fund, Bucklebear, Family Expo, Juvenile Justice Teen Court, Success by 6, The Kids on the Block, Done in a Day, Civil Citation Program for Juveniles (renamed Project FAME for Juveniles in 1999-00), Family Visitation Center, and Women Helping Women. JULEP’s signature fundraisers, Marketbasket and Bargain Sale, were continued each year with great success. An American Girl Ice Cream Social was held in conjuction with Marketbasket in 1996 and 1997. The Public Affairs Committee hosted the State Public Affairs Conference (1991-92). In 1994-95 The RED (Research/Evaluation/Development) Committee was created and charged with researching, evaluating and developing projects and fundraisers for the League.). The League purchased Lot #43 adjacent to League Headquarters to secure future expansion possibilities (1995-96). Two new awards were established in 1998-99 for Active and Provisional members — Ray of Sunshine and Above and Beyond. The first “Passing the Gavel Ceremony” was held in 1998-99. The gavel is passed from oldest to most recent president. A Membership Menu was developed in 1998-99 which clarifies member status and obligations and allows members to go Sustainer after seven years of Active service regardless of age. Dues increased to $100 for Actives and Provisionals and $75 for Sustainers in 1998-99. Researched production of a new cookbook, which was approved to begin in 1999-2000. Recipes were collected and tested. Throughout the 1990s many training seminars were offered. In 1999-2000 the seminars focused on diverse topics in four categories – Health and Fitness, Finances, Home and Garden, and Food and Entertainment. Collection and testing of recipes for our new cookbook, Artful Entertaining…Southern Style! continued. Nine original watercolors by renowned artist Paul Jackson were commissioned for the coffee table styled book. Done in a Day completed 19 projects. Grants for Excellence funded 81 grants to teachers in Escambia County and 52 grants in Santa Rosa. The Women Helping Women committee continued collaboration with the Suit Yourself Clothes Closet, Food Source and PACE Center for Girls. The Junior League Scholarship Program awarded 10 scholarships and an endowment fund for PJC scholarships was continued. A task force began research on a Women’s Research Center. This was the final year for Bucklebear, Kids on the Block and the Juvenile Justice Teen Court and Project FAME for Juveniles. Hosted the sixth Lunch with the League with Linda Ellerbee as featured speaker. The event was held at the National Museum of Naval Aviation and attended by 450 people. The first shipment of our new cookbook, By Invitation Only…Artful Entertaining, Southern Style, arrived in May and 1,958 books were sold before the end of the month. Framework was established to implement the Junior League of Pensacola Endowment Fund. Done in a Day completed nine projects for Waterfront Rescue Mission Women and Children’s Shelter, Operation Christmas Child, Catholic Charities, Pensacola Junior College Community Health Event, Association for Retarded Citizens, Christmas Parade, Alpha Center, Hallmark Elementary School and Children’s Services Center. Grants for Excellence contributed $10,000 to fund grants to Escambia County teachers in 40 schools and $5,000 toward grants to 43 Santa Rosa County teachers. Women Helping Women continued services to the Suit Yourself Clothes Closet and the Pace Center for Girls and awarded five scholarships through the Women in Transition Scholarship Program. A partnership began with Covenant Hospice, and monetary donations were made to the Diagnostic Mammogram Initiative. The Food Source program was discontinued. Women’s Resource Center completed a formal business plan for the establishment of a resource center, with plans to transition the program to another community organization for implementation. An account was set up to hold contributions to the Endowment Fund pending selection of a professional fund manager and market research and planning were done to prepare for the kickoff of the fundraising campaign in the 2003-2004 year. Done in a Day completed nine projects: Family Expo, The Healthcare Center of Pensacola, Children’s Services Center, Loaves and Fishes, ARC Santa Rosa, Christmas Parade, Family Literacy Center/Beggs Education Center, Ensley Elementary School and Think First/Safe Kids. In addition, assistance was provided to the American Cancer Society, Escambia AIDS Services and Education Inc., the Northwest Florida Area Agency on Aging and Children’s Home Society. Grants for Excellence provided $10,000 to Escambia County teachers and $5,000 to Santa Rosa County teachers. Women Helping Women continued collaboration with Suit Yourself, Pace Center for Girls, Hospice and our scholarship to PJC’s Women in Transition program. A Breast Cancer Testing program was added. Because of a perceived manpower problem, Women’s Resource Center was sunsetted and the business plan was made available to any agency interested in taking on a project with a similar focus. Three new project were approved for 2003-2004: Boost America, Girls to Girls and News in Education. Bylaws and policies pertaining to the purpose, function and authority of the Sustainer Board were approved. A Technology Committee was formed and work began on construction of a JULEP website. Some Like It South! celebrated its 20th anniversary and printed 5,000 copies for its 8th printing. Longtime JULEP employee Dot Bonifay retired in February 2004 after 24 years. Lexie Thorsen was promoted to office manager. The League contributed $5,000 to the Endowment and $200 in memorial and tribute donations were received, bringing the Endowment money market year-end balance to $15,215. First year project Boost America partnered with Success by 6/United Way of Escambia County by making presentations and purchasing 280 booster seats, fitting 78 children at sitting events at area schools and automotive dealerships. In the spring, a preschool/daycare program was being developed to educate 3-4 year-olds on the transitional process from internal harness seats to booster seats. Done in a Day completed 10 projects: Two Bereavement Box projects, Playground Painting at Escambia Westgate School, Baptist Family Health Expo, Halloween at the YMCA, Therapeutic horseback riding for at-risk youth, Miracle Camp, Immunization Party, FavorHouse, Making Kids Shine. Girls to Girls, collaborating with Top of the Bottom Ministry, held several events including a successful outing making Valentines and career discussion. JULEP donated $10,000 to the Escambia County Foundation for Excellence and $5,000 to the Santa Rosa Foundation. In partnership with each county’s Foundation for Excellence, more than $22,000 was awarded to Escambia County teachers and almost $37,000 to Santa Rosa County teachers for a total of 95 individual grants and more than 25,500 children impacted. Committee hosted both the Santa Rosa and Escambia County’s receptions to honor the recipients. Twenty site visits were made in the spring to follow up on projects. Women Helping Women concluded its last year as a Junior League project. Work with PJC ensured a continued endowment fund for scholarship money. One new project was approved for 2004-05 (Women’s Cancer Initiative). A new fundraiser was adopted for 2004-05 (Party with a Purpose) taking the place of Bargain Sale for the year. Bargain Sale planned to take place again in 2006. Hurricane Ivan strikes Pensacola and the surrounding area September 16. JULEP headquarters sustained more than $30,000 in damage. More than 50 JULEP members sustained total or catastrophic losses to their homes and/or businesses. A Relief Fund was established and a total of $9,755.17 was contributed by the end of May 2005. A committee was formed to oversee the distribution of funds. Monies were distributed to the following agencies: Bay Area Food Bank, Escambia County Foundation for Excellence, Good Samaritan, Humane Society, Loaves & Fishes, Manna Food Bank, Rebuild Northwest Florida, Santa Rosa Educational Foundation, Top of the Bottom Ministries, as well as providing holiday toys for children housed at FEMA trailer sites during December 2004. 50th Anniversary Task Force was formed to plan celebration of JULEP’s 50th Anniversary in 2006. Membership adopted the Council System of governance, to begin in 2005-2006. Office manager Lexie Thorsen was promoted to Executive Director. As Bargain Sale was voted to become an event held every other year, JULEP’s first-ever Party with a Purpose fundraiser took place March 11, 2005, at Seville Quarter. 325 tickets were sold with a profit of more than $15,000.00. Boost America, in partnership with United Way/Success by 6, assisted with Pensacola’s Largest Baby Shower, distributing information about Child Passenger Safety and Kid Care Insurance. A booster seat fitting was planned and held at Toys R Us. Done in a Day completed six projects: Camp Happy Sands, Santa Rosa County Health Department Book Drive, Ronald McDonald House of Pensacola’s 20th Anniversary Celebration, Habitat for Humanity, CHIPS Therapeutic Foster Homes/Lakeview Center, Inc./Children’s Christmas Party and Children’s Services Center. Girls to Girls, collaborating with Top of the Bottom Ministries, met with their group of girls to mentor six times during the year, offering different mentoring and social opportunities. JULEP donated $10,000 to the Escambia County Foundation for Excellence and $5,000 to the Santa Rosa Educational Foundation. Contributed $4,000 to Pensacola News Journal in providing seven Title 1 schools in Santa Rosa County with NIE learning centers, 15 teachers with NIE literacy training and curriculum and 400 students with NIE learning materials and supplies. Teachers received a 2-hour in-service training, teacher learning guides, apple pocket charts, acitivity toolboxes, classroom supplies for the NIE center and newspapers delivered every Monday for 21 weeks. The Enabling Fund distributed funds to the “Preemie Regatta” which raises funds in support of the Neonatal Unit at Sacred Heart Health Systems and funds were distributed to Junior Achievement. On August 29, 2005, Hurricane Katrina struck the Louisiana, Mississippi, Alabama and Florida coast. JULEP joined in the effort of sending financial aid through AJLI to assist victims. JULEP held a 50th Anniversary Party on March 25 at Skopelos. The event was themed around each decade. 244 attended. Grants for Excellence provided grants to 150 teachers in Escambia and Santa Rosa counties and donated $10,000 to the Escambia County Foundation for Excellence and $5,000 to the Santa Rosa Educational Foundation. The League provided Newspapers in Education $4,000 in funding and provided volunteers to visit classrooms and help deliver curriculum to help meet needs of children performing below Florida’s FCAT standards in reading and writing. In April, Junior League joined AJLI’s project Kids in the Kitchen during National Volunteer Week, reaching out to children at two local YMCAs with nutritional information in an effort to combat childhood obesity and teach better nutritional habits. JULEP concludes its 50th Anniversary Celebration holding a luncheon on August 29 at the Naval Aviation Museum with 150 attending. Under the Communications Council umbrella, a Speakers Bureau was formed to organize JULEP members to speak at various events, organizations and groups throughout the community telling about what the Junior League of Pensacola is and does. Marketbasket celebrated its 20th year. The Endowment Fund reported its Endowment Fund Campaign pledges at $33,150, with $14,700 to be collected over the next three years. The Endowment balance as of March 31, 2007, was $31,323.00. The Grants for Excellence project provided 74 grants to teachers in Escambia and Santa Rosa counties. Membership voted in March to continue the Enabling Fund, adopt a Signature Focus Project of Foster Care, continue Girls to Girls and early sunset Women’s Cancer Initiative, and return to training just one Provisional class per year. JULEP continued its involvement with AJLI’s project “Kids in the Kitchen” holding six sessions in May at the YMCA Langley Avenue addressing proper nutrition and obesity in children. Kickoff year for our new signature focus – foster care. Some Like It South’s was re-printed for the 9th time. Grants for Excellence provided 70 grants to teachers in Escambia and Santa Rosa counties. The Junior League donated the Paul Jackson painting “T.T. Wentworth Museum” to the T.T. Wentworth Museum in appreciation and honor of its long-standing partnership with the museum, and so it can be enjoyed by all who visit the museum. A Strategic Plan was created, developed and carried out to track progress and set benchmarks for the Junior League of Pensacola’s Council structure. The long-running Billet Doux newsletter was phased out. The weekly eMinder email newsletter became the central communication to the membership. The Endowment Fund reported a balance of $46.668 for the end of the 2008-09 year. Grants for Excellence was sunsetted at the end of 2008-09, but not before presenting a $10,000 grant to FamiliesFirst Network of Lakeview for foster children, as well as a $3,000 grant to the Escambia County’s Foundation for Excellence and $2,000 grant to Santa Rosa Educational Foundation. Steppin’ Out held four events with 25-30 girls participating in various mentoring sessions. Done in a Day held 10 events. JULEP received the Circuit One Community Alliance “Volunteer Group of the Year” Award. The Sustainer Council continued the Duffle Bag Project, raising over $3,715. The Junior League of Pensacola presented COX with the Paul Jackson “Blue Angel” watercolor painting as part of their outstanding sponsorship contract. The Community Council held a Partner Reception at the Fish House in the fall. A special fundraiser benefitting the Steppin’ Out project was hosted by the Independent News in February in conjunction with their Valentine Hot List. The event raised more than $2,500. With the country’s economic downtown since September 2008, JULEP saw lower attendance with fundraisers and fundraising income, as well as increase in resignations and found this to be the case with many sister leagues and nonprofit organizations in the country and local community. The League saw rapidly declining membership numbers during the beginning of this decade – a result of worsening economic conditions and other factors. Concerned active and sustaining members developed and supported a variety of strategies to help re-build the momentum. A Bylaws Review Committee was formed to review the governing documents and recommended changes were presented and approved by the League in September 2013, with some changes taking effect prior to that date for a trial period. A “Points System” was approved to begin the 2012-13 year, replacing the previous system that had separate requirements for community service, event participation and cookbook support. The rate of Active/New Member membership resignations began to slow in 2013 in large part due to the Bylaws and Policies changes that lessened membership requirements and made attaining requirements more flexible and reaching Sustainer status more achievable. Due to the decrease in manpower, the League eliminated some committees while other committees operated with just a chair or a handful of people. The League temporarily suspended the Council system of governance beginning with the 2013-14 League year. The Membership Council recommended and implemented a change in the New Member on-boarding strategy starting with the 2012-13 New Member Class. The League now places New Members on a committee immediately rather than waiting until they become Active Members. New Member satisfaction has gone up since this change was implemented. Budget cuts were made each year to ensure every area of the League operated in the leanest way possible. Significant discussion was conducted by the Board regarding the possibility of selling the League Headquarters building and the adjacent empty lot at Jefferson Park. The membership voted against selling the building at the March 2013 General Membership Meeting. The Board sought proposals from local Realtors and, at the end of 2012-13, put the lot on the market to sell and the building on the market for partial lease. A sale of the lot or lease agreement on the building had not yet been finalized as of this history update (July 26, 2014). Membership voted to increase dues for Active Members from $125 to $135 during the 2012-13 League year and from $135 to $150 during the 2013-14 League year. A committee was formed during the 2011-12 League year to research and propose a new Signature Focus. The committee met throughout the spring and early summer, conducted a survey of area nonprofits, and polled the membership for preference on the League’s new focus area. The new Signature Focus, Children’s Health and Wellness, was announced in Fall 2012 for a trial year, with full implementation to occur during the 2013-14 League year. During the 2012-13 League year, all community service committees were organized as one committee, the Done in a Day committee. In 2013-14, the Done in a Day Committee was renamed the Community Impact Committee to reflect the committee’s overall scope of work as the League’s primary community outreach committee. The committee organized League projects supporting numerous community groups including the March of Dimes, Big Brothers Big Sisters of Northwest Florida, Manna Food Pantries, Food for Thought, Oakcrest Elementary School, American Heart Association, and the American Cancer Society. The newly re-named Community Impact Committee led the implementation of JULEP’s signature community project, Kids in the Kitchen. In 2013, the Community Impact Committee formed a sub committee to implement the program in the Pensacola community. Throughout the year, JULEP members brought Kids in the Kitchen programming to several community-wide health events, including the Worldwide Day of Play, March for Babies and Northwest Florida Heart Walk. In October, the League teamed up with Sacred Heart Hospital to host a “Healthy Halloween Party” at the Greenhut Auditorium. In May 2013, the League partnered with Oakcrest Elementary School for a Kids in the Kitchen Family Night, providing approximately 27 children and their families with information and resources for a healthier life. The League co-sponsored a screening of the powerful documentary, Miss Representation, in May 2014 with women’s networking group, Powerful Women of the Gulf Coast. Written and directed by Jennifer Siebel Newsom, the film exposes how mainstream media contribute to the under-representation of women in positions of power and influence in America. The film challenges the media’s limited and often disparaging portrayals of women and girls, which make it difficult for women to achieve leadership positions and for the average woman to feel powerful herself. Marketbasket was held for the last time Nov. 17-19, 2011. The fundraiser had been held continuously for 25 years and planning was under way for the 26th event when, in September of 2012, low participation from vendors made it necessary to cancel the event. League members came together to develop a new fundraising event, a casino night called “Red Haute Royale,” which was held for the first time on Dec. 1, 2012. Red Haute Royale was held again in 2013 and 2014. During the 2011-12 League year, Bargain Sale was restructured into “Neighborhood Bargain Sales.” This format eliminated most overhead expenses and reduced the amount of manpower required, but profits were small. The final Bargain Sale was held March 2, 2013.
o In January of 2013, an ad-hoc committee was formed to research a new fundraising event focused the promotion of JULEP cookbooks. The new event was quickly developed into “Junior League Dishes It Out: A tasting and shopping showcase for people who love to eat, cook and entertain.” The first Dish It Out was held Saturday, July 27, 2013 with a portion of the proceeds benefitting Gulf Coast Kid’s House. The second was held Saturday, March 29, 2014, and a committee was placed to organize the event for 2015. To promote the second event, the committee designed and built a custom Mardi Gras float and debuted the JULEP “Krewe of Aprons” at the 2014 Pensacola Grand Mardi Gras Parade. From 2012-14, the Corporate Development Committee served in a more broad capacity known as the Fundraising Committee. The committee was charged with researching and presenting new fundraising ideas as well as recruiting corporate sponsors. The committee organized numerous “done in a day” fundraisers during this three year period. Most of the events were designed to provide a social activity as well as a source of funds. The events included a painting party at Painting with a Twist, a “sip and shop” at Nancy’s Haute Affairs, and a spring-time croquet tournament called “The JULEP Cup.” The committee organized a partnership with the Lullabies and Mudpies organization in support of their spring 2014 consignment sale, with a portion of proceeds benefiting the League. Though many events and strategies were attempted, no new fundraising events or tactics were approved for future years. The function of the committee was re-evaluated and for the 2014-15 year will focus solely on corporate sponsorship development.